Your skin and hair routine is extremely important. I am huge believer on maintaining radiant clear skin and my close friends know that very well about me. There is never one day when I go to bed or leave the house without giving my face a thorough cleanse, exfoliation and moisture it needs. I don’t wear any foundation or cover-up (because of allergies) so it is very critical for me to keep my skin clean and rejuvenated from the airborne toxins, oil and environmental pollutants that enters my skin and hair. If you’ve got super sensitive skin like me, it’s best to opt for chemical free products made from the purest ingredients, free from synthetics, artificial ingredients and other comprising ingredients that may irritate your skin. 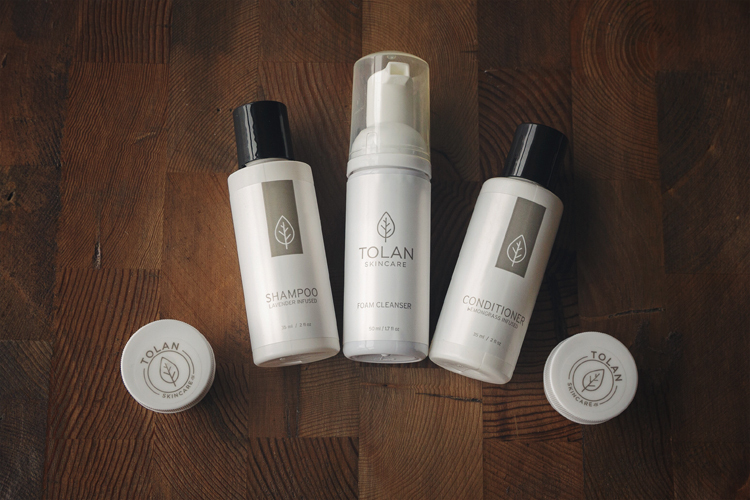 Which brings me to tell you about my experience with the new Tolan Skincare. It is very natural and has a light, beautiful scent with no perfume that could irritate the skin (especially mine!). The sulfate-free shampoo and conditioner was the highlight of my experience that includes the lavender and lemongrass scented aromatherapy and ingredients that’s safe for my colour treated hair (which kept me in the shower longer than expected). What’s even better is that it’s all made in Canada! This post is brought to you by Tolan Skincare.